On this tour, discover some of South America's fascinating cities—Rio de Janeiro, Buenos Aires, Montevideo, and Manaus—along with Brazil’s Amazon. Rio de Janeiro is an exciting city known for its beautiful beaches, vibrant atmosphere, gorgeous scenery, and welcoming people. 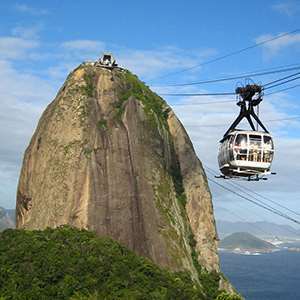 On your guided sightseeing tour of Rio, take the cog railway 2,300 feet up to the summit of Corcovado to view the infamous Christ the Redeemer statue and to enjoy 360-degree views. 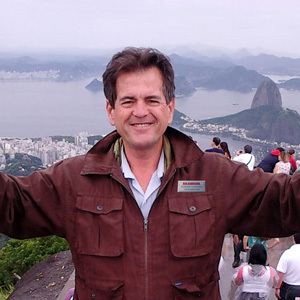 Also have the chance to eat at a famous local churrascaria and enjoy a free day to explore on your own. Buenos Aires is known as the "Paris of South America" with its wide boulevards, outdoor cafés, and charming shops. Here, your sightseeing with a Local Guide includes the city's landmarks and Recoleta Cemetery, where Eva Peron is buried. You’ll also enjoy a Tango show and a free day to explore Buenos Aires on your own. In Uruguay, enjoy guided sightseeing in Montevideo and in the colonial city of Colonia del Sacramento, a UNESCO World Heritage Site founded in 1680. A highlight of this South America tour is Iguassu Falls, one of the most spectacular sites in the world! Just imagine the thundering roar of the 275 waterfalls spanning almost two miles wide! See the brilliant rainbows created by clouds of spray and stand mesmerized on both the Brazilian and Argentine sides of the falls. 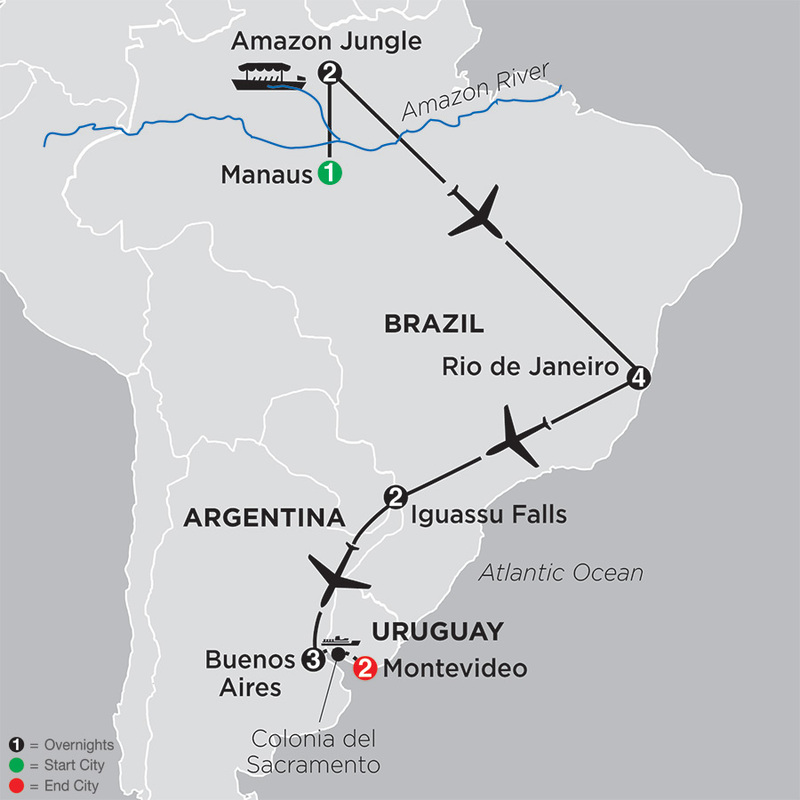 You'll even take the ecological jungle train through the rainforest on the Argentine side. But that’s not all…also enjoy Brazil’s Amazon. Stay inside the Amazonian rainforest, cruise on the river, enjoy Naturalist-guided walks to see the flora and fauna, and spend time in an Amazon village learning about the local way of life. From the vibrant cities to the spectacular scenery, this South America tour is the perfect vacation for value-minded travelers! Welcome to spectacular Rio de Janeiro, home to white-sand beaches and host of the 2016 Summer Olympics! After arrival, settle into your hotel and meet your Tour Director, who will have pointers for your free time exploration. Sprawling between majestic granite peaks and the blue South Atlantic, Rio is a city of beauty, wonder, and energy. Guided sightseeing with a Local Guide begins with a drive along Rio’s famed Leblon, Ipanema, and Copacabana beaches. Take the cog railway 2,300 feet up to the summit of CORCOVADO to view the famous Christ the Redeemer statue and enjoy 360-degree views of Guanabara Bay and the bustling city below. Your afternoon is free to explore—perhaps join an optional excursion to a nearby favela for a glimpse into the life of these colorful communities that nearly 20% of the people call home. 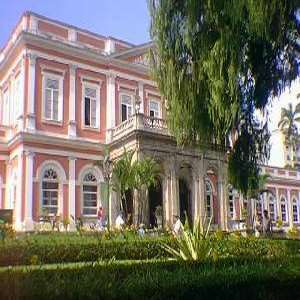 A free day in Rio allows you to relax on one of the famous beaches or take an optional excursion to the historic city of Petropolis to see the former summer palace of Emperor Pedro II. A morning flight takes you to Iguassu Falls, one of the greatest natural wonders of the world. Upon arrival, journey to the Brazilian side of the FALLS to see the mammoth series of 275 waterfalls cascading over a precipice almost two miles wide and 250 feet deep. Walk into Devil’s Throat Canyon, where the clouds of mist, thundering roar, and 180-degree rainbows surround you— an unforgettable experience! Cross the border for a visit of the Argentine side of the FALLS. Begin with a short ride on the open-air ECOLOGICAL JUNGLE TRAIN through the rainforest. A series of boardwalks takes you above the falls to see the water crashing down into the Devil’s Throat. 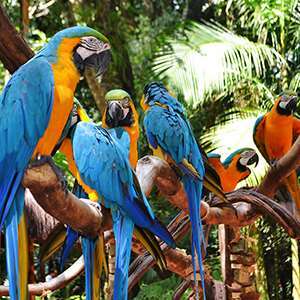 Your afternoon is free to explore, or you may opt to visit the Bird Park, home to many species of endemic birds, as well as flora from the area. Morning sightseeing with a Local Guide focuses on the city’s landmarks, including the Colon Opera House and Plaza de Mayo, site of La Casa Rosada (the President’s Pink House), and Metropolitan Cathedral. Also, visit La Boca and San Telmo, one of Buenos Aires’ oldest neighborhoods, and RECOLETA CEMETERY, where Eva Perón is buried. End your day with an Argentinean meal, followed by a sensuous TANGO SHOW highlighting the alluring dance that is so popular here. 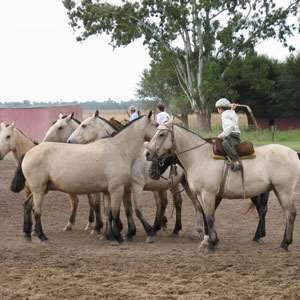 Today is free for independent activities, or you can take an optional excursion to visit a local estancia (ranch) to experience the life of the gauchos (cowboys), as well as traditional dance performances and a barbecue lunch. Board a high-speed catamaran bound for the UNESCO World Heritage Site of Colonia del Sacramento, Uruguay. After lunch in Colonia, your Local Guide takes you on a guided tour of this colonial city founded by Portuguese settlers in 1680. Later, board a bus for Uruguay’s capital city, Montevideo. On a city tour of Montevideo, drive along the Atlantic Coast to the city center and visit Constitution Square, the cathedral, the colonial Town Hall, and Independence Square. Other areas visited include the Prado area, Batlle y Ordoñez Park, the residential area of Carrasco, and Plaza Virgilio.